A free audio cutter software to cut or merge audio files. Free audio cutter software to cut or merge audio files. Free Audio Cutter is an easy-to-use and free audio cutting software to cut audio file into small pieces or merge audio files into one large file. You can select the cut points manually using the embedded audio player or automatically cut the audio file into equal-size fragments. You can also add multiple audio files into the list, and merge these files into one audio file. With Free Audio Cutter, you can easily cut off any unnecessary parts of an audio file you don't want and rearrange the rest parts. It's very useful for creating custom ringtones or managing long audio recording files. Free Audio Cutter supports cutting or merging audio formats MP3, OGG, WAV and WMA. It doesn't support DRM protected WMA files for copyright reasons. Free Audio Cutter works on Windows XP, Windows Vista, Windows 7 and Windows 10, both 32-bit and 64-bit versions. Click the download button above to download Free Audio Cutter full version. Full version means the installation file is complete and doesn't require additional video codec or audio codec to run. Full version also means Free Audio Cutter software doesn't have any watermark, nag screen, time expiration or function limitations. The audio cutting is more accurate. You can enter millisecond value for start and end positions now. The new software interface of Free Audio Cutter is easier to use. You can cut audio files and merge audio files in the same window now. Added settings window. You can set sampling frequency, channels mode, bitrate and VBR for each audio format. There was conflict if you installed both Free Audio Converter and Free Audio Cutter software in the same computer. This conflict bug has been fixed. Small improvements and small bugs fixed. Easy to use - A couple of clicks to finish parameters settings, audio cutting or audio merging. Free to use - 100% free to download, install and use, no watermark, no limitation and no extra fee. Free Audio Cutter - Cut a big audio file into small fragments. Free Audio Merger - Merge some small audio files in one large audio file. Convert audio files - Cut from one audio format and convert to another format, or merger many audio files with different audio formats. Support many audio formats - Weeny Free Audio Cutter supports popular audio formats MP3, OGG, WAV and WMA. Flexible audio settings - Set audio sampling frequency, channels mode, bitrate and VBR. No file size limitation - You can cut any size of audio file you want. 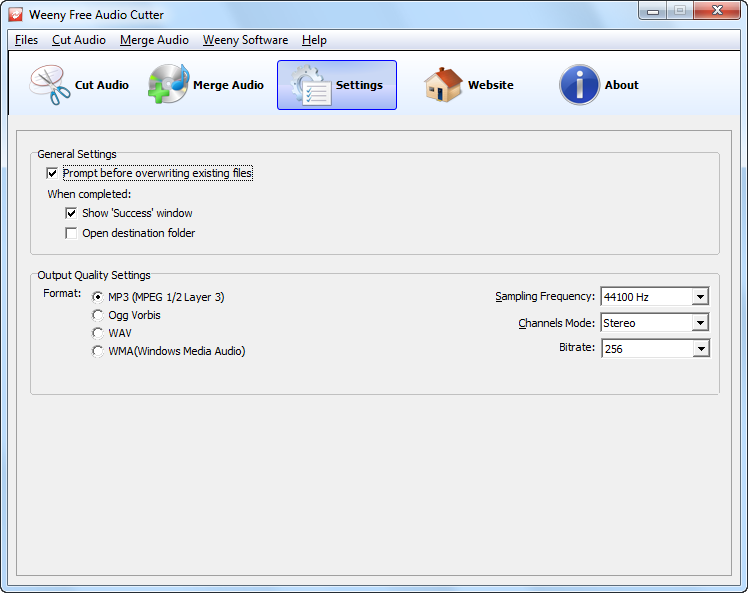 Weeny Free Audio Cutter is a free software to cut audio files into small pieces or merge audio files into one large file. Weeny Audio Cutter is completely free to download and install. Third when you are done with selection the cut points, press the Split Now button. And finally you have the desired song segment that you wanted. So all Weeny Free Audio Cutter has is good features to help you cut or merge a song of your choice. This should be convincing enough to make you give it a try. For splitting your audio files, you should not trust any application you see. Instead, let Weeny Free Audio Cutter help you with the task. This is a software that is very easy to install and comes with all necessary tools for splitting your audio files. The splitting process takes place in the application's interface. That interface is very reliable and nicely designed. There are two options to split your audio files. One is to select the size of each segment. The other is to let Weeny Free Audio Cutter cut the files equally. There is no restriction as to the format of audio files the application can cut. For merging your audio files, Weeny Free Audio Cutter is still the software of choice. Rest assured that the splitting/merging process does not alter the original content of the files.